Mastercard and Visa Start Banning VPN Providers? Following the introduction of restrictions against file-sharing services, Mastercard and Visa have reportedly started to take action against VPN providers. This week, Swedish payment provider Payson cut access to anonymizing services after being ordered to do so by the credit card companies. VPN provider iPredator is one of the affected customers and founder Peter Sunde says that they are considering legal action to get the service unblocked. Payment providers are increasingly taking action against sites and services that are linked to copyright infringement. There’s an unwritten rule that Mastercard and Visa don’t accept file-hosting sites that have an affiliate program and PayPal has thrown out nearly all cyberlockers in recent months. It now appears that these policies have carried over to VPN providers and other anonymizing services. 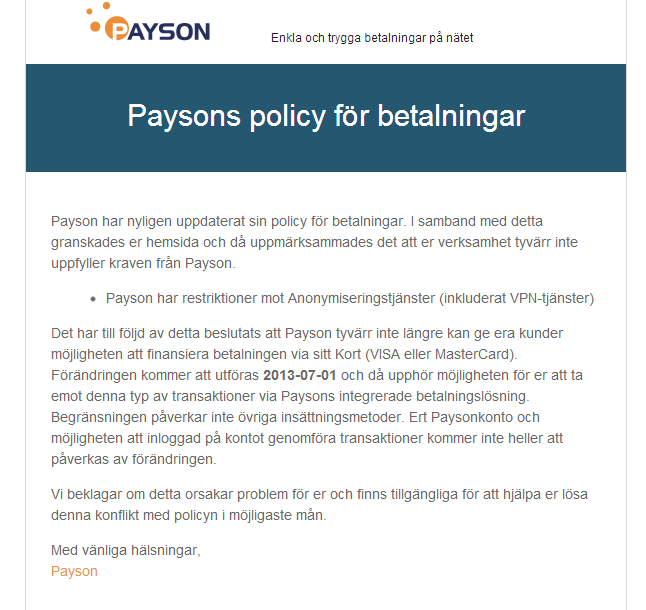 Before the weekend customers of the popular Swedish payment service provider Payson received an email stating that VPN services are no longer allowed to accept Visa and Mastercard payments due to a recent policy change. “Payson has restrictions against anonymization (including VPN services). As a result Payson can unfortunately no longer give your customers the option to finance payments via their cards (VISA or MasterCard),” the email states, adding that they still accept bank transfers as deposits. The new policy went into effect on Monday, leaving customers with a two-day window to find a solution. While the email remains vague about why this drastic decision was taken, in a telephone call Payson confirmed that it was complying with an urgent requirement from Visa and Mastercard to stop accepting payments for VPN services. One of these customers is the iPredator VPN, launched by Pirate Bay co-founder Peter Sunde and friends. Sunde tells TorrentFreak that he is baffled by the decision, which he believes may be an effort to prevent the public from covering their tracks online and preventing government spying. “It means that US companies are forcing non-American companies not to allow people to protest their privacy and be anonymous, and thus the NSA can spy even more. It’s just INSANE,” Sunde says. Sunde explains that iPredator will always have plenty of other payment options, but sees it as an outrage that Mastercard and Visa have apparently decided to ban a perfectly legal technology. “For iPredator there are always other payment methods, like Bitcoin, but it’s insane to censor a totally legit system that is there to avoid censorship and surveillance,” Sunde says. Despite these alternatives, Sunde is not going to stand idly by. He informs TorrentFreak that Ipredator considering taking legal action, citing the Wikileaks win against the credit card companies as a favorable precedent. Ipredator is far from the only VPN provider that is affected by the policy change. Anonine, Mullvad, VPNTunnel, Privatvpn and several others are also using Payson’s services. At this point it’s unclear why the two companies are taking a stand against anonymizing services. It seems likely that an industry or authority has been pushing for the policy change behind the scenes. However, with privacy high on the agenda with the PRISM scandal, the move comes at an odd time. TorrentFreak has reached out to Mastercard and Visa but we have yet to hear back from the companies. We are not aware of any other payment service providers who have taken action against VPN providers, so the scope of the actions are unknown at this point. Update July 4: Visa Europe told us that it “has not been involved in this matter in any way, and has not made any such stipulations to Payson or to any other organisation.” We specifically asked whether VPNs and other anonymizing services are in any way prohibited by Visa, but the company didn’t confirm nor deny. Visa believes that the issue was raised by Payson’s acquiring bank, which acts as an intermediary between payment processors and card associations such as Visa and MasterCard. Update July 8: MasterCard also denies that they are responsible for Payson’s decision to stop accepting VPN services. 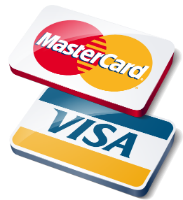 “Contrary to earlier reports, MasterCard has not been involved in this matter in any way. We have not placed any restrictions on Payson.” MasterCard’s Senior VP of External Communications, Andrew Bowins, told TorrentFreak. The company agreed to offer more insight into their policies which we will address in an upcoming article. We have asked Payson to clarify the discrepancy and will update the article when we hear back from them. c There are 542 comments. Add yours?